The 2017 National Championships will be hosted from coast to coast with nine events across eight cities in Canada. This year, more than 900 teams will compete for the title of National Champions. VC is very excited to host alongside Volleyball NS and to welcome teams to this event! All team registrations for Nationals are done on the Volleyball Registration System (VRS). For assistance on registering a team, please consult the Nationals Registration Guide. If you wish to withdraw from Nationals, please complete the Nationals Team Withdrawal Form. Teams who withdraw after the roster lock date will forfeit their full registrations fees. Check-in will take place Thursday May 11th, 2017 from 5pm-8pm at the Canada Games Centre. For full details on the check in process please review Section 9 of the Competition Guide. Only individuals on the official team roster can check-in their team (head coach, assistant coach, team contact, manager). The players themselves are not required to be at check-in. Proof of age must be presented for all players in the form of a government issued ID (copies are encouraged). Teams who are not available during the listed check-in time will be required to submit a late check-in request and will be charged $50. Coaches are required to provide their NCCP number at check-in. View the list of all registered teams for this event. Roster Lock is the last day in which team personnel or players can be added to the team roster. All team rosters must be finalized in the VRS by 11:59PM EST on Tuesday April 4th, 2017. Please be sure to review section 3.2 of the 2017 Competition Guide for complete details on the composition of the official team roster. The Editing a Roster Guide will provide details regarding changes to a roster. No changes to the official roster will be permitted following this date. No changes to the official roster will be permitted at Coach Check-In. Rosters must match the provincial roster. Graham Loyst - events@volleyball.ca or 613-748-5681 x238. Volleyball Canada’s Stay to Play policy is in effect for all Indoor National Championships. This means that all participating teams are required to book hotel rooms through the event’s Accommodation Management Provider (AMP), in order to be eligible to play in the tournament. For more information on the Stay to Play policy, please review the Volleyball Canada Stay to Play Overview and our Frequently Asked Questions document. HTG Sports Services is the official AMP for the 14U Atlantic Halifax Nationals. All bookings must occur through the HTG booking portal. Register your team to participate in the event. Once complete, you will receive a registration confirmation email that includes a unique team code and a link to book the team's accommodations. Click on the link and select your preferred hotels. Include the team code to submit the booking request. A booking confirmation will be delivered via email. Book now if you have not yet booked your accommodations. Proximity Exemption Request: A team is based within 75km of the competition venue OR the team plans to stay with family or friends that resides within 75 km of the competition venue. Special Exemption Request: For exemption requests that do not fall under the above category, please fill out this Special Exemption Request. Jennifer Kealey - HTG Sports Services - jennifer@htgsports.com or 1-800-668-5596 x 300. Caitlin Devlin - Volleyball Canada - caitlin@volleyball.ca or 613-748-5681 x229. Be sure to use our official travel booking partner for the VC Nationals. Absolute Travel is an optional service to help ease the booking process. Why use Absolute Travel for your bookings? Agents with knowledge of VC Nationals. Group booking services not available with major airlines. Access to competitive group rates. Booking flexibility – deposits only required at time of booking; passenger names only required 45 days prior to departure. Comfort of mind knowing that someone is taking care of your group travel! Elayne Pink - epink@absolutetravelspecialists.com or call toll-free 1-866-322-6538. Wave times are now available! Final Schedules will be finalized the evening prior to the first day of competition. In most cases, final schedules do not change very much from the draft schedule however it must account for any late changes to the number of participating teams. Teams are only permitted one 60 minute practice slot and are asked to promptly exit the court space at the end of the reserved time to allow the next team to begin their practice. Practice times will be allocated on a first come, first served basis. You will need to bring a copy of your proof of purchase along with a piece of government issued photo identification with you to will call. Event passes can be picked up during the coach check-in or at any time during the weekend. Be sure to watch our full coverage of action on court 62 throughout the whole weekend! Each team will be required to provide two volunteers per match to act in the role of line judge and score keeper. Anyone associated with the team may perform this role. Each team will be provided an extra team accreditation that can be provided to a non-team supporter acting in this role. There will not be any formal scorekeeper training prior to the event; however we encourage all attendees to familiarize themselves with the scoresheet. Thank you to all parents/supporters who take on this role throughout Nationals! All results can be found on our competition management website (ISET). Please consult the Competition Guide for information on guidelines that are specific to Volleyball Canada National Championships. These include, but are not limited to, team composition, player registration, seeding and draw principles. Please consult the 2016/2017 Volleyball Canada Indoor Volleyball Rulebook for information on the rules and regulations that govern play at Volleyball Canada events. In addition, the 2016/2017 Indoor Rule Updates summarizes the most recent rule changes or updates. Please consult the 2017 Nationals Age Categories document for details on the age categories that will be in place for the National Championships. Please consult the 2017 Volleyball Canada Coaching Certification Policy to learn about the certification requirements for coaching a particular age category at National Championships and the sanctions associated with a failure to meet these requirements. Please consult the Volleyball Canada Concussion Policy and Protocol to see the measures that we will be implementing at all National Championships. Please consult the 2017 Volleyball Canada Libero Uniform Guidelines for information on acceptable and non-compliant jersey combinations. 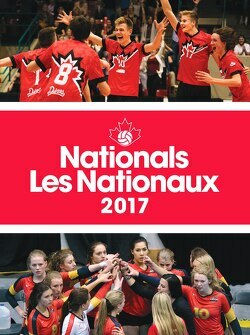 The purpose of this Code of Conduct and Ethics is to ensure a safe and positive environment within Volleyball Canada programs, activities and events, by making all individuals aware that there is an expectation of appropriate behavior, consistent with the values of Volleyball Canada, at all times. Please consult the Stay to Play Policy for information regarding accommodations during the Volleyball Canada National Championships and consult the frequently asked questions document. Please consult the 2017 seeding document. Please note seeding principles differ across various age groups. This document outlines the circumstances in which foreign individuals and foreign teams may participate in VC sanction events. Be sure to check this section regularly as we will update as new contests and promotions as they become available! We are always looking to improve our National events through participant feedback. Please take some time to tell us how we did by completing the 2017 Post-Event Survey. Fill out the survey for your chance to win a great VC prize pack!